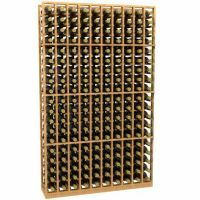 The Allavino CKC-310 Pine Wood wine rack offers the largest cube size of any wine rack kit on the market. Pine is a great material for wine racks due to its long-lasting durability and attractive coloring. The Allavino rack is unfinished for a rustic look and provides an option for people who want to avoid lacquers and stains in their wine storage area. They are designed to fit all 750ml wine bottles. This wine rack is 10 column wide and 19 rows high. This 10 column standard wine rack can be combined with any of our AllaVino Series Racks allowing for easy customization of your cellar.